Kramer Electronics is offering one final chance to enter its iPad 2 contest. 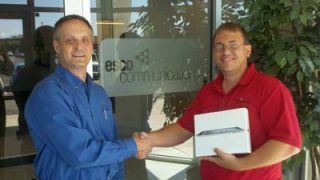 Kramer’s regional sales manager, David Goldsmith (left), presenting July winner Darin Hutson (right), with his brand new iPad 2. The company will hold one more iPad 2 drawing at the end of August. "Like" Kramer Electronics on Facebook and fill out the entry form under the Drawings Tab, and you could win the last iPad 2 to be given away in the contest. The contest will help to support Breast Cancer research. For every person who “Likes" Kramer's page on Facebook through August 31, Kramer will donate $1.00 towards Breast Cancer Research.